A small Irish Wolfhound may be able to use an electronic PlexiDor, but large individuals will not be able to get through the opening. Measure your dog and cut out the opening size in a piece of cardboard to see if they can step through. The PlexiDor Electronic accommodates pets up to 125 pounds, and the opening size for the pet is 12 5/8″ x 19 5/8″. Most male Irish Wolfhounds weigh more than 120 pounds with the majority between 140 and 180 pounds. 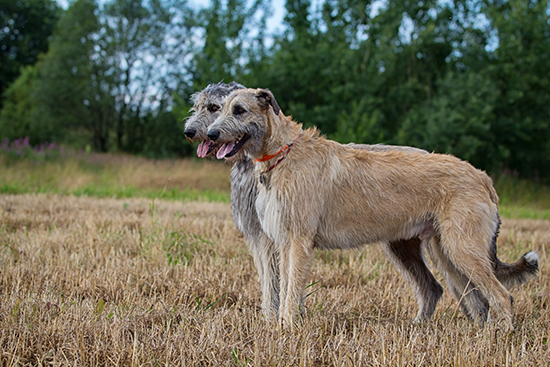 The female Irish Wolfhounds usually weigh between 115 and 140 pounds. When it comes to giant breeds such as this one, the Extra Large PlexiDor is a better choice. It has an opening size of 15 3/4″ x 23 5/8″ and accommodates dogs up to 220 pounds. If you are uncertain, contact our customer service at 800-749-9609.